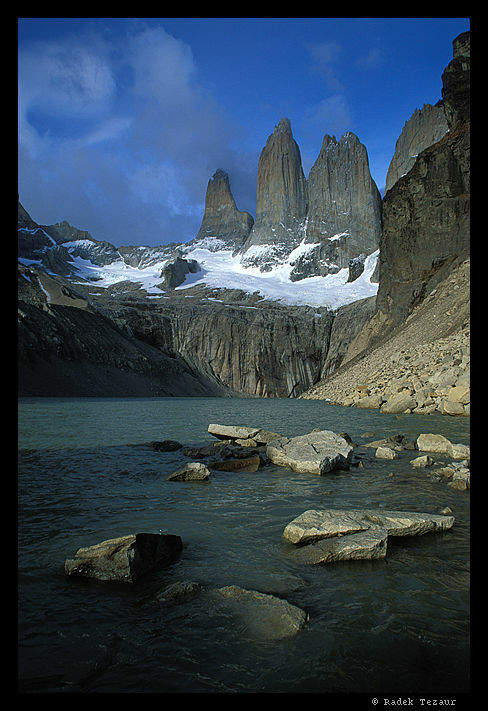 After returning from Isla Navarino to Punta Arenas, we looked forward to our next destination - Torres del Paine national park. 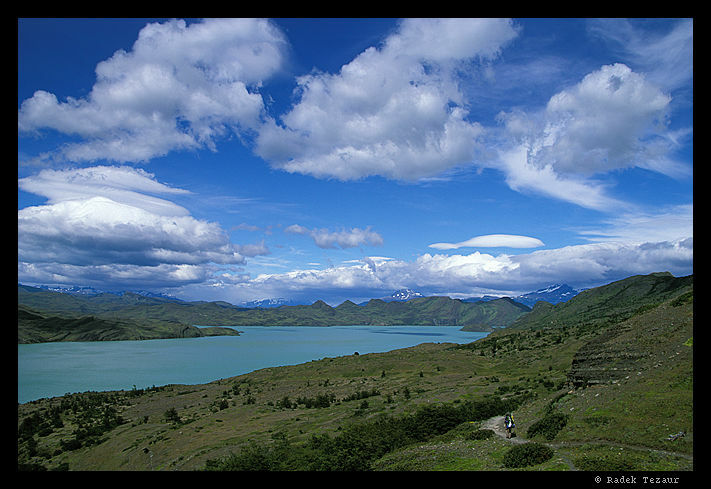 The park was established in 1959 and its main attraction are rugged mountains of the Paine range rising to over 3 kilometers above the surrounding plains. 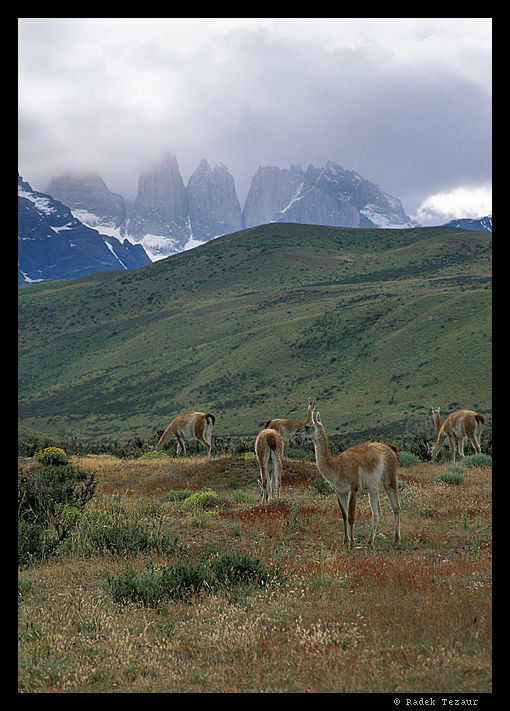 To the west and northwest of the park is Hielo Sur, the southern Patagonian icefield, to the southwest sounds of the Pacific, to the east open pampa. This travelog documents our trip there. If you are not interested in reading the entire travelog, you may still find my tips section and the GPS coordinates interesting. Including the days we arrived and left, we spent a total of ten days in the park, and each section describes one of them. We wasted little time after arriving from the airport - still in the evening we bought supplies for our next trek. Radka and I had another great seafood dinner, which was a welcome change after our mostly oatmeal/bread type of a diet on the trek. As our hand-washed clothes were not quite dry in the morning, I ran out in search of a laundromat. To no avail, I only found a 'lavanderia', where they would wash our clothes again, but would not understand I just needed a dryer. Oh well. We took a bus to Puerto Natales. It was a comfortable three hour ride on a good paved road. We spotted a few nandus in the pampa near Punta Arenas. Later on, as the terrain became a little more hilly, we rode by a few 'estancias', big farms, and some low growing forests of wind stunted trees. Along the 250 plus kilometers of the road, there is only one small town. In Puerto Natales, Martina found a little travel agency that would give us a ride to the park in their van for about $14 per person. This saved us more than half a day compared to our original plan, which was to spend the night in Puerto Natales. It is a dirt road all the 120 km or so to the park, again mostly through a pampa. When we got close to the park, we pulled over to take a few photos of guanacas. It was mostly cloudy and quite windy. As if it ever was not windy. We paid a fee of 6500 pesos at a 'guarderia', an entrance station to the park. Our driver drove us all the way to the foot of the mountains (138m) at Hosteria Torres. After pondering what to do next, we decided not to camp there, even though it was getting quite late, and instead to make our way up into a valley below the Torres to Campamento Chileno. The trail was steep and our backpacks were very heavy. We arrived to Campamento Chileno at about 10 pm while it was getting dark by the minute. But the few camping spots were occupied and they were right next to a 'hosteria', a mountain hut, so we continued up. The trail entered a forest and we put on our headlamps. The howling wind and darkness made walking in the forest a bit spooky. Fortunately, except for a few creek crossings, the trail was easy to follow. After about an hour of walking, we finally arrived at Campamento Torres (567m). I borrowed Radana's watch the night before so I could get up for the sunrise. When the alarm went off at about 4:15, I would kill for a bit more sleep. I stuck my head out of the tent, and above me, through trees branches moving around in the wind, I saw one star. So I figured, it was a go. I woke Radka and Zdenek up, and we set off up the moraine to the lookout. The sky was not nearly as clear as I would have wished. In fact it was mostly cloudy and the star I saw from the tent was probably the only one visible out there. The sunrise was still a bit away, but after a while there was enough light to put away the headlamp. I wanted to get to the lookout early to be able to set up my camera gear in time, so I left Radka and Zdenek behind me as I hurried up the steep slope. When I got there, the towers were half way in the clouds, and the wind was brutal. It was a little chilly as well, and with all the clouds, a nice sunrise seemed like a long shot. Not exactly what I was looking for, but I still set up on a big flat boulder, holding on to my tripod at all times. At times like this, I always remember leaving my camera on my unsecured tripod on the fresh ice of the Loch in Rocky Mountain National Park only to have to pick up the pieces of my favorite lens a few seconds later. Radka and Zdenek arrived shortly and seemed less inspired by the elements than I was. I actually enjoy this kind of weather, even though it makes taking photos difficult. As the sunrise approached, it became clear that the sun was not going to hit the towers. The sky started to clear up some more though. The clouds have gradually lifted from the towers, and later as we hopped around on the boulders above the moraine lake, we finally got to see them in their full glory. And what a jaw dropping sight it was. From where we were standing (906m), it was still almost 2000 meters to the top of the highest one, even though it seemed as if you extended an arm, you could reach the summit. Zdenek left after a while, but Radka and I stayed for two more hours until about nine, watching clouds drifting in the sky around and above the towers, and ice drifting in the lake below them. We spent the rest of the day hanging around the campsite, sun bathing - our faces, it was a little too cold to expose anything else - and such. Karel, Martina and Premek went to 'Valle Silencio' to see the towers from the other side. They reported it was surely worth the trip. Zdenek accompanied Radana to the lookout one more time. We left early at about eight and backtracked down the valley in a beautiful weather. We walked above the north shore of Lago Nordenskjold, a large lake, greenish in color, passed underneath the Cuernos, the Horns, after the Torres probably the most prominent peaks of the range, and arrived at Campamento Italiano (228m) at about six. The campground, situated in a forest, was almost full and most campsites were right next to the busy trail. On top of that, my stove started acting up, I had to take it apart and clean it, and my water filter clogged up with glacial silt from Rio Frances below the camp. I put off cleaning the filter till the morning. It was a long day as it was. We hiked up the valley, admiring Rio Frances and Glacier Frances on the slopes of Cerro Paine Grande, at 3050m the highest mountain of the range. 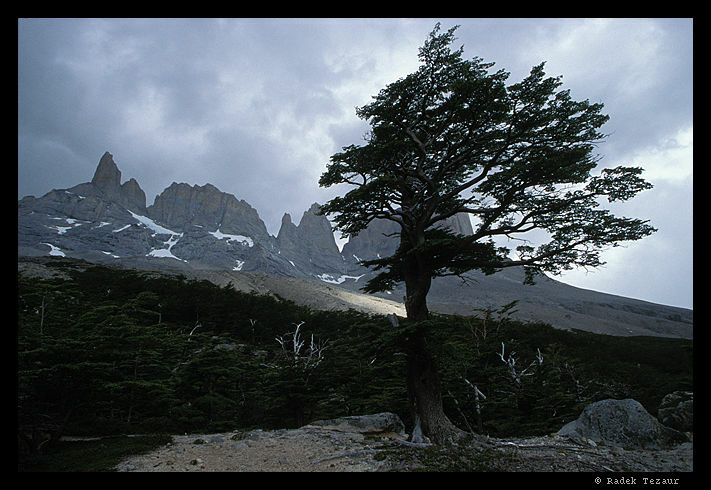 After leaving some moraine boulders behind, we walked out of the forest into a small open area, where the wind made standing upright almost impossible. So we continued as fast as we could into the wind to find shelter in the woods again. A basin gradually open up in front of us, and we soon reached Campamento Britanico (693m), a nice campground in a forest next to Rio Frances. Most people come up into this dead-end valley only for a day hike, choosing not to haul their big packs all the way up here, and this greatly limits the numbers who camp here. After a break for lunch, Radka and I headed the trail to a lookout (770m) above the camp, and then further up above the timberline for an even better view of the basin. We did not stay up there for too long as the weather took a turn for worse and it started to drizzle a bit. I woke up to the sound of snow pattering on the tent. It was just a shower and the snow was not sticking to the ground, but another shower soon followed. So Zdenek, Radana, Radka and I decided to abandon our plan of staying here all day. It looked like it was going to be another gray cloudy day at best. 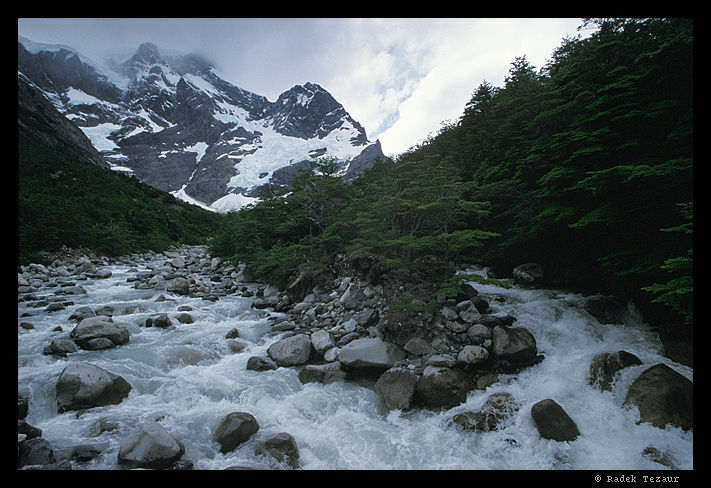 We headed back down the trail through the forest and over many undulations created by creeks flowing into Rio Frances. This time it was not nearly as windy. We crossed Rio Frances over a suspension bridge at Campamento Italiano, and continued toward Lago Pehoe. 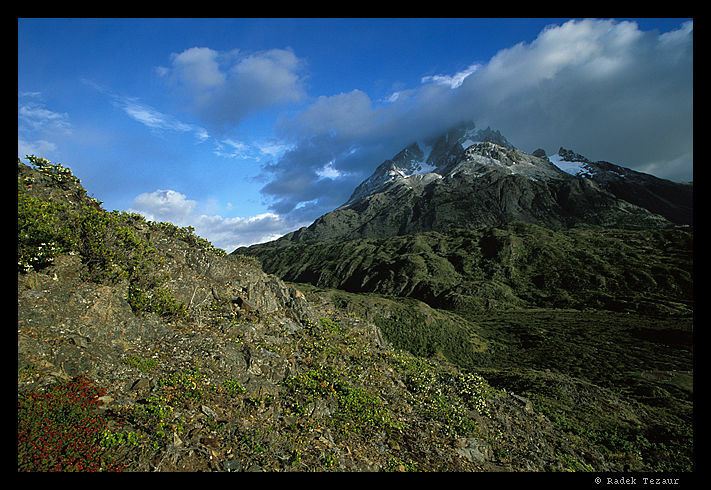 When we were about halfway there, the clouds thickened and for a while I watched a storm coming off Cerro Paine Grande with curious amusement. But soon it became clear, the storm would not miss us, and in no time heavy horizontal rain arrived. By the time we got to the lake, the rain was over. Unlike our previous campgrounds, this one was in a barren area by Lake Pehoe (37m). Not only that, it was a paid campground ($2.50 per person) and we were told to find an empty campsite, a difficult task at best. So we, like many others, squeezed into a space between two campsites. A few bushes around provided limited shelter from the wind. It was a very windy night and I got up before the sunrise to shoot a few photographs. I walked up a small hill above the lake and in spite of the incessant wind, enjoyed views of the blue water of Lake Pehoe and sunlit slopes of Cerro Paine Grande. Our next goal was Glacier Gray, but we had to cross a hill separating Lago Pehoe and Lago Grey first. Leaned forward we made it across the areas most exposed to the wind. We did not watch icebergs floating in the lake for long and quickly descended into the calm of the forest, that grows to greater heights here than we had seen anywhere in the park. Being on the leeway side of the range probably has something to do with it. We spotted a few green parrots, and soon arrived at shelter and camping Gray, close to where the glacier terminates in the lake. We found that the boat to the other end of the lake operates on irregular schedule and decided we would walk back to Lake Pehoe. But not until we explored the area a little bit. We continued along the lake and the glacier and in about an hour and a half we reached Campamento Las Guardas (299m), a small campground in a forest of tall trees.